Born on July 5, 1980, in the town of Kotovsk, Odessa Oblast, Ukrainian SSR. 2 years later moved with his parents to Rybnitsa, MSSR. In 1997 he successfully finished Rybnitsa school no. 6. In 1997 was a winner of the Republican Olympiad in history. In 2002 he graduated with honour from the sociology department of the Faculty of History, Pridnestrovian State University named after T.G. Shevchenko. In 2012 he completed with distinction Master’s Degree Programme of the National University “Odessa Law Academy” in the field of international law. Since September 9, 2002, he has been working in the system of the Foreign Ministry of the Pridnestrovian Moldavian Republic. He began his professional career in the position of an officer of the News Department of the Pridnestrovian MFA. 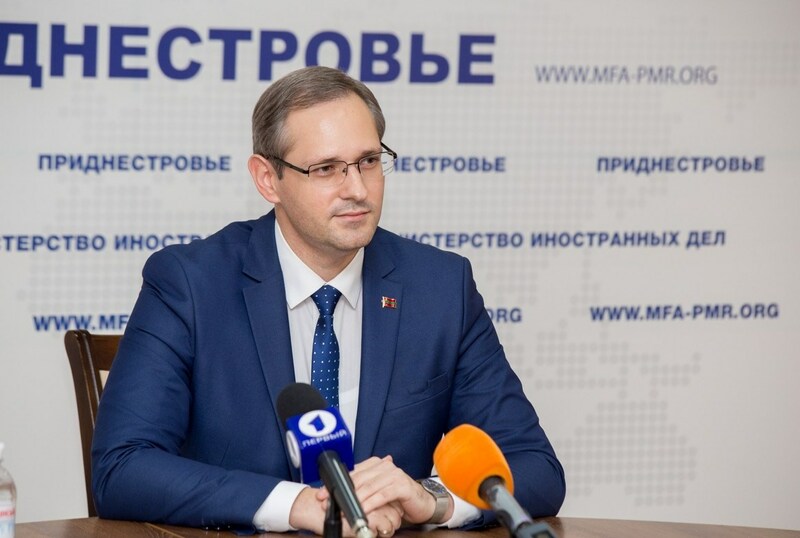 He went through the stages of his service in the positions of adviser-speechwriter, press secretary, head of Media Relations Department, deputy head of the News and Analysis Office of the Foreign Ministry of the Pridnestrovian Moldavian Republic. no. 1368rp from December 20, 2010, he was appointed acting Deputy Foreign Minister of the Pridnestrovian Moldavian Republic. Under Decree of the President of the PMR no. 680rp from July 8, 2011, he was appointed Deputy Foreign Minister of the Pridnestrovian Moldavian Republic. Under Decree of the President of the PMR no. 85 from February 7, 2012, he was appointed Deputy Foreign Minister of the Pridnestrovian Moldavian Republic. Under Decree of the President of the PMR no. 86 from February 8, 2012, he was conferred a diplomatic rank of Extraordinary and Plenipotentiary Envoy of the second class. Under Decree of the President of the PMR no. 219 from June 8, 2016, he was conferred a diplomatic rank of Extraordinary and Plenipotentiary Ambassador. In accordance with Decree of the President of the PMR, by decision of emergency meeting of the JCC from February 16, 2012, Vitaly Ignatiev was appointed member of the Joint Control Commission from Pridnestrovie. Since 2006, he has been teaching a number of special courses at the Department of Political Science and Political Processes of the Institute of History, State and Law of Shevchenko Pridnestrovian State University. On December 30, 2015 under Decree of the President of the PMR he was appointed Acting Minister of Foreign Affairs of the PMR, and on August 31, 2016, was appointed Minister. Under Decree of the PMR President No. 219 of June 8, 2016, he was conferred the diplomatic rank of Ambassador Extraordinary and Plenipotentiary. On January 30, 2017, he was reappointed by the PMR President Vadim Krasnoselsky. Since 2014 he is a Ph.D. student of the Department of World Political Processes of MGIMO. Medal “25th anniversary of the Republic of South Ossetia” (September 19, 2016).